On Thursday, 7 February, Bacardi employees around the globe are sending out their 'out of office' emails to turn up at local hotspots in cities around the globe as part of the brand's second annual 'Back to the Bar' event. Coinciding with the company’s annual Founder’s Day, Back to the Bar commemorates the 157th anniversary of Bacardi, the world’s largest privately held spirits company. More than 7 000 Bacardi employees across 130 global cities will go to 1000+ bars during a 16-hour period. "Back to the Bar is based on our belief that our brands are built in bars, not boardrooms. As Bacardi celebrates its 157th anniversary, it’s important to reconnect with our roots, think like founders and put our own feet on the street to see first-hand how our business, bars and consumers are changing," says Mahesh Madhavan, CEO of Bacardi Limited. "For Bacardi people, visiting bars is often more work than play as we do on-the-ground research and put ourselves in the role of salespeople and social media influencers. Hashtags are a hot topic for Back to Bar crawls," adds Madhavan. According to Barcadi, it has encouraged all employees to think like salespeople, with the ability to influence the business at a grassroots level. Today, influence takes on a new connotation, and Back to the Bar aims to unleash homegrown Insta-influencers from all levels of the organisation. From trends like 'drink less but better', 'Instagrammable handcrafted cocktails' and 'no/low is the new go-to', Back to the Bar will aim to shine a light on important trends in the drinks business that flourish with millennials. "The cocktail revolution continues as more people from more places drink more varieties of spirits than ever before, and bars and bartenders are on the frontlines," says Jacob Briars, Bacardi’s global advocacy director. 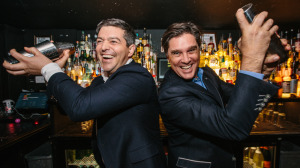 "In addition to spending time with consumers, 'Back to the Bar' is a chance for us to thank the bars and restaurants who support us and the world’s best bartenders, who are truly on the cutting edge of what’s new and next in our business," adds Briars. As part of this year’s ‘Back to the Bar’, François Portier, area director for South and East Africa, and Nicolas Koumbarakis, brand ambassador sub-Sahara Africa will be going Back to the Bar at Rockets Bryanston and Gemelli’s in Johannesburg, respectively. Cocktails from the world-class portfolio of Bacardi will be available, including the BACARDÍ® Cuba Libre, MARTINI® Negroni cocktail and PATRÓN® Margarita. For more information, visit www.barcadi.com. You can also follow Barcadi on Facebook, Twitter or on Instagram.